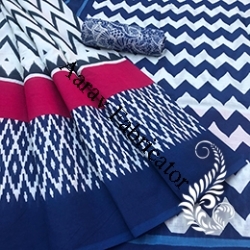 Aarav Fabricator is Manufacturer, Supplier and Distributor of Exclusive Collection of Woman Sarees (Various Colours, Patterns and Designs) In Jaipur Rajasthan India. 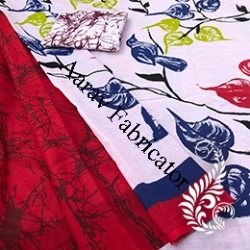 Aarav Fabricator offering complete choice of Latest Design Cotton products which include Cotton Saree. 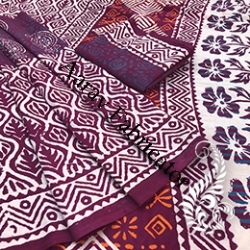 Such as hand block print cotton Saree, Cotton Print Sarees, traditional Bagru Hand Block Printed Cotton Saree, Bagru Dabu Print Cotton Sarees, Bagru Discharge Print Cotton Saree and many more items. 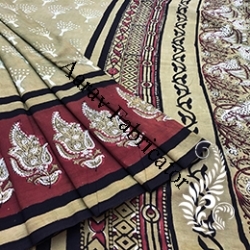 Sarees is a Woman's attire whether It is for any marriage, tradition occasion, family gatherings, and formal wear as for any other festive parties. Cotton Sarees are The all time favourites of The ladies Its Reflecting True India Culture in The classiest way. 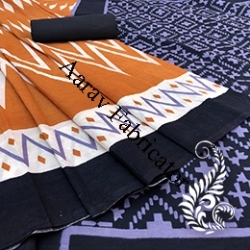 Aarav Fabricator Being Forth a vast assortment of Cotton Printed Sarees, Cotton Designer Sarees, Hand Block Printed Sarees, Designer Cotton Silk Sarees, Bagru Hand Block Print Sarees and Sanganeri Printed Sarees Which Is Designed In Time With The Latest Fashion Trends and Market Demands. There is Quality for Shrinkage and Colour fastness and is offered in industry at industry leading prizes. 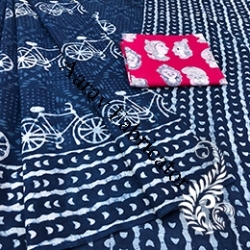 The cotton Sarees washed regularly and it's comfortable for the hot Indian Summers. 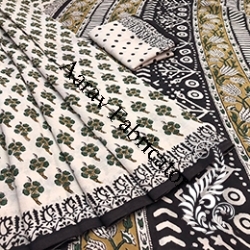 Aarav Fabricator Cotton Sarees - Manufacturer of Exclusive Collection of Woman Hand Block Printed Cotton Sarees In Jaipur Rajasthan India. 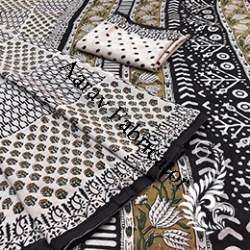 Latest designed Block Printed Sarees is an ideal piece latest fashion design. 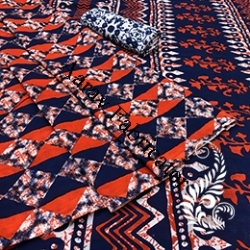 Featuring alluring hand block pattern, Colourful colours combinations and flawless finish, this array of sarees adds grace and elegance to the personality of women. 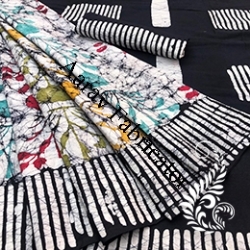 Latest Designer Colourful fashionable Cotton Sarees can be available in different colour patterns, designs and finishes. 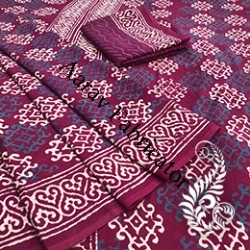 Aarav Fabricator are reckoned as one of the trusted and reliable names, engaged in manufacturing and supplying of a wide collection of beautifully Latest designed Bagru Hand Block Printed Sarees available in different colours like red, black, purple, green and many more, Bagru Hand Block Printed Sarees are designed as per the latest market trends. 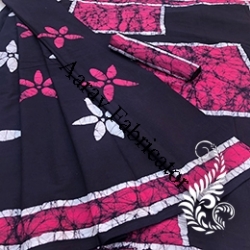 Sanganeri Hand Block Printed Sarees Available in attractive designs and magnificent colour combinations, Aarav Fabricator Sanganeri Hand Block Printed Sarees collection is like every woman. 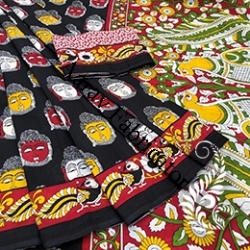 Our wide range of traditional Sanganeri Hand Blocked Printed Saree is made using a variety of fabrics and colours. 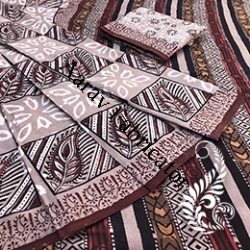 Sanganeri Hand Blocked Printed Saree include crepe, chiffon, cotton, georgette and other suitable materials. 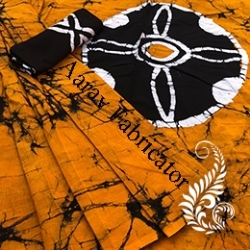 Batik print cotton sarees are Available in alluring designs and striking color combinations; Aarav Fabricator contributes to the utmost variety of Batik Printed Sarees collection. 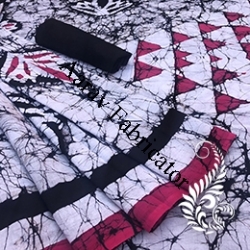 The fabric and the material used have been selected cautiously, keeping in mind to deliver high quality to the customer. Bulk orders are also taken to deliver the best quality at best value in the industry. 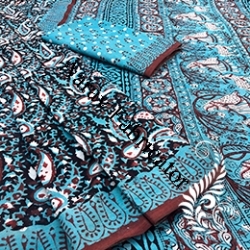 Our wide range of traditional Batik Printed Cotton Sarees is made using high quality of fabrics and colors. 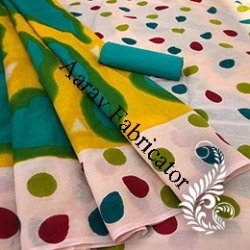 Aarav Fabricators are renowned Cotton Saree Wholesaler, Distributor, and Manufacturer based in India. 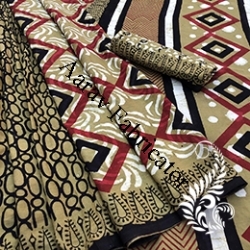 Saree is an elegant women attire suitable for every occasion whether for any marriage, custom event, social occasions, and formal wear. 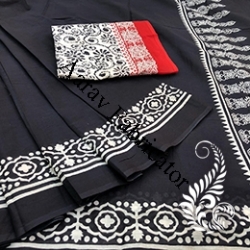 We are offering complete variety of Latest Design Cotton items created with 100% pure cotton as per latest market trends and customs. 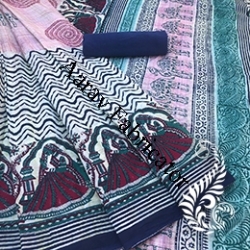 Like, hand block print cotton Saree, Printed Cotton Sarees, customary Bagru Hand Block Printed Cotton Saree, Bagru Dabu Print Cotton Sarees, Bagru Discharge Print Cotton Saree and many more. 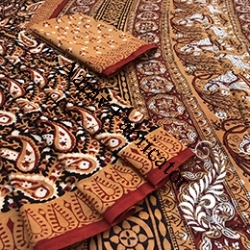 You can view our unique collection on our website or contact us for further information. 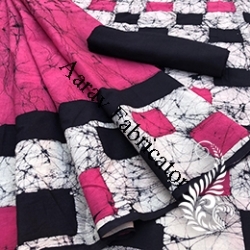 Aarav Fabricator is famous Cotton Sarees Exporter, Manufacturer, and Distributor of cotton garments and fabrics all over world including India, USA, Canada, Asia, UK, Australia, and other famous countries. 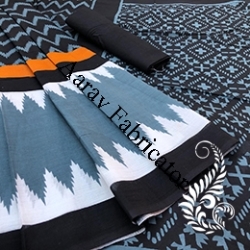 Cotton Sarees are known for their sheer surface, light weight and a reflexive straightforwardness. 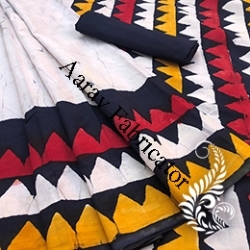 Cotton Saree is a typical name with appeal in center and rich social orders in India and Worldwide. 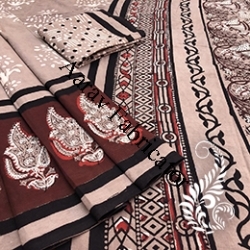 We offer a wide and unique collection of cotton Sarees in various designs and patterns. 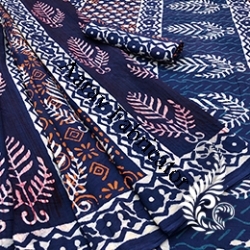 Claims to fame of these cotton Sarees are its wonderful piece, dynamic colors, unrivaled cotton textures and patterns. 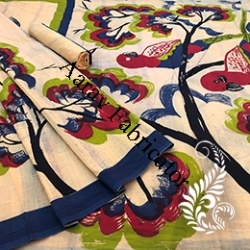 Our collection is available at an affordable cost and is exclusively designed as per our clients demand.